Learning about the structure of the nail can help you understand the importance of proper nail care and help you to diagnose minor problems that can present themselves in the nail bed. The nail, whether it is a fingernail or a toenail, has many distinct parts that require proper care. The nail root is where the magic happens, so to speak. Also called the germinal matrix, this is the area of the tissue that sits under your skin, starting a few millimeters into your toe or finger and terminating at the base of the visible nail. Your blood vessels provide the root with nutrients, which your body uses to create your nail. Also called the half moon, this is the white curved piece that you can see at the very base of your nail. You can see it best when you hold your hands in front of you with your fingers pointing upwards. It is easier to detect on the thumbs and big toes, in many cases. This is actually the edge of the nail root and is essential in nail formation. You may have heard of the cuticle due to the prevalence of products designed to soften it. This area, also known as the eponychium, sits between your skin and your nail plate at its base. It works like a sealant to make sure water can't get under your skin at the base of your nail. Having a little bit of cuticle is good and healthy. 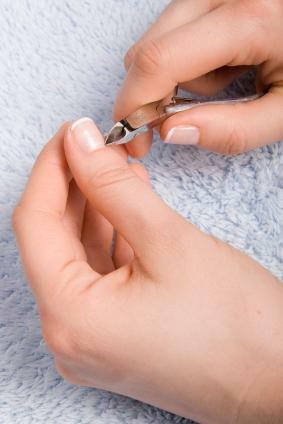 Similar to the cuticle, this part sits between the skin and the nail plate at the sides of your nails. At times, your nail may grow into the perionychium, resulting in an ingrown nail or hangnail. This is the part you think of when you picture the fingernail. It's the hard, brittle area that you cover with polish. It is not pink, but translucent in appearance, since it is made of keratin. It only looks pink because you can see the blood vessels beneath it. The top is smooth and the bottom is grooved. The grooves help it stay attached to the nail bed. While not actually part of the nail itself, the nail bed is essential in nail creation. It adds strength and thickness, thanks to nerves, melanocytes and blood vessels. Growth doesn't end at the root, but continues all the way to the free edge. That's why it hurts so much when your nail gets peeled back. This is the piece of the nail that has the whitish appearance and is painless to trim off. It is also the least protected and most vulnerable part since it no longer receives nourishment from the body. The point where the free edge connects to the fingertip or toe tip is known as the hyponychium. Like the cuticle, it keeps the connection between the nail and the skin waterproof. Note that you may see slight differences in the spelling of the names of the parts of the nail that are scientific terms.